The National Theatre presents another play about English myth-making. Saint George and the Dragon is billed as a ‘new folk tale’ by Rory Mullarkey, writer of The Wolf From the Door, a comedy which juxtaposed English village tradition with something more volatile and revolutionary. 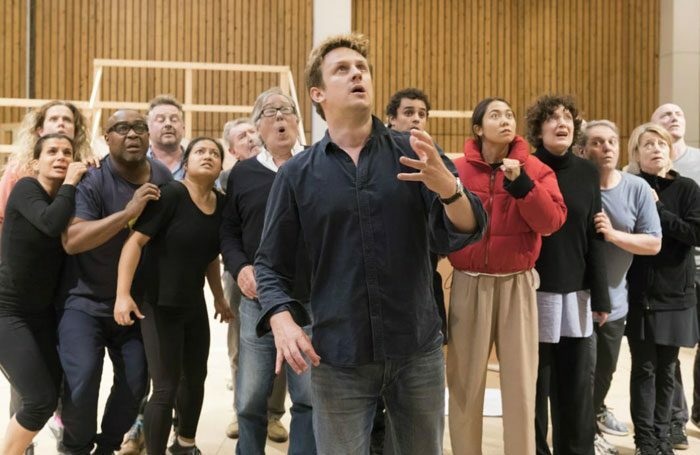 Lyndsey Turner directs a cast led by the always-engaging John Heffernan. Javaad Alipoor’s The Believers Are But Brothers was one of the most interesting offerings at this year’s Edinburgh fringe, an intelligent intricate examination of masculinity and radicalisation in the digital age that used an integrated WhatsApp group to further explore its subject matter. We called it “a boldly staged, gut-twistingly resonant lecture on internet radicalisation” in our four-star review. It’s at Home, Manchester, from October 9-12 as part of the Orbit festival. The new show by Barrel Organ – the company behind Nothing and Some People Talk About Violence – comes to London’s CPT this week, after premiering at the Edinburgh fringe. An intriguing, Lynchian two-hander about the damage done by debt, it runs from October 10-28. The Wardrobe Ensemble, two time winners of the The Stage Edinburgh Award, brings its smart, funny touring show, about the 1990s school system, to Northampton. Angela Clerkin’s new show, The Secret Keeper, described as a “fairytale for adults” about privacy and responsibility, opens at Ovalhouse ahead of a UK tour. Hope Mill Theatre, the new powerhouse of musical theatre in Manchester has been open for less than two years but this week sees its second production transfer to London, with its revival of the late 1960s Broadway hippy musical Hair, moving to the Vaults that “left me walking on air.” It opens on October 11 and on November 11, there will be a clothing optional performance — for the audience, not just the actors! 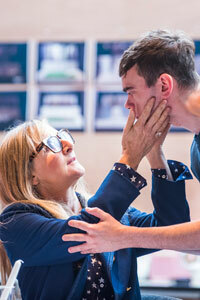 Lesley Sharp and Brian Vernel in rehearsal for The Seagull. Photo: Tristram Kenton. World premiere from the all-male BalletBoyz of their latest show Fourteen Days takes place at Sadler’s Wells on October 10, prior to a national tour. Four new short pieces join the previously staged Fallen, with choreographers that include Christopher Wheeldon (currently also represented in London by An American in Paris), Javier de Frutos and Craig Revel Horwood (who is currently also gracing the stage at the Piccadilly as Miss Hannigan in Anne). The always prolific Simon Stephens offers a new version of Chekhov’s The Seagull, opens at Lyric Hammersmith on October 11, two nights after the West End premiere of his Broadway play Heisenberg at Wyndham’s. Lesley Sharp stars as Arkadina. The hit Tony winning Broadway import Oslo transfers to the West End’s Harold Pinter Theatre, opening on October 11, after a 26 performance run at the National first. One-off performance of the Rodgers and Hammerstein classic South Pacific stars Rosalie Craig – who will lead the cast of Sondheim’s Company in the West End next year – and John Owen-Jones.